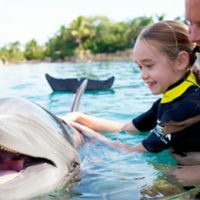 Offering a fun-filled water playground, onsite childcare and kid-friendly dining, all in an upscale atmosphere, the Walt Disney World Swan and Dolphin Resort provides guests with a family-friendly vacation experience, along with many of the perks of an onsite Walt Disney World Resort stay. 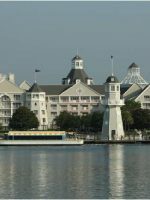 A short walk or boat ride to the International Gateway at Epcot and Disney’s Hollywood Studios, the Swan and Dolphin are two hotels in one. The 756-room Swan and 1,500-room Dolphin opened in 1990. The resort provides a number of unique amenities for families. From complimentary childcare with dining to bargain-rate snacks and beverages available through its Personal Pantry stocking service, kid-toting travelers will appreciate the efforts management has made to facilitate an easy and enjoyable getaway. 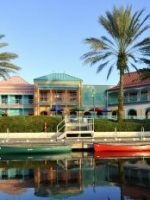 Designed by renowned architect Michael Graves and adorned by two 56-foot dolphin statues weighing 60,000 pounds each, the Dolphin property is about double the size of its neighbor, the Walt Disney World Swan, with differing lodging options and dining opportunities. The Swan is also adorned by two 47-foot Graves-designed swan statues. Standard rooms at the Swan contain two beds and accommodate four guests, as opposed to the smaller beds and maximum occupancy of five in Walt Disney World Dolphin rooms. Executive Suites accommodate fewer people than similar spaces at the Dolphin, but offer more elbow room for traveling families. Along with two signature dining experiences, a coffee bar and a casual poolside grill and scoop shop, the Swan is home to Garden Grove — a playful family venue which hosts breakfast and dinner buffet meals with a cast of Disney characters. Along with two celebrity restaurants, a poolside beach club, an American diner and ice cream fountain, the Dolphin is home to Picabu. This inviting dining option is a 24-hour cafeteria which serves up family-style meals in an ultra-casual atmosphere. Besides a three-acre pool complex, a beach, staff-led activities for kids and evening childcare at Camp Dolphin, family guests can enjoy an onsite playground, an arcade, adult and teen treatments at Mandara Spa and nighttime entertainment, from campfires with S’mores to “Glow in the Dark Volleyball” games. 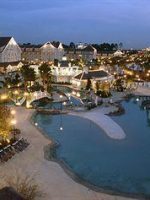 For families, one of the most attractive resort benefits is the ability to take advantage of “Extra Magic Hours” at Walt Disney World Resort theme parks. 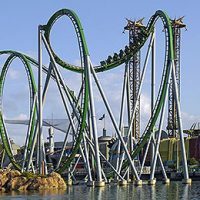 Through this program, overnight guests enjoy the exclusive ability to enter theme parks early or stay late while enjoying select attractions. Additional perks include complimentary theme park parking, the ability to make FASTPASS+ reservations 60 days in advance and free transportation throughout the World. Unlike at Disney-owned resorts, guests are not eligible to participate in the Disney Dining Plan. There is a fee for self-parking and airport transportation is not included. The Swan features 756 guestrooms, including 55 suites, situated in a 12-story main building and two, seven-story wings. Rooms are crisp and contemporary with clean lines and earth tones, which nicely contrast with blonde woods and crisp white linens. Deluxe Westin Heavenly Beds cradle guests in comfort, with pillow-top mattresses, down comforters and overstuffed pillows. Standard Guestrooms contain one or two beds and sleep up to four. Some standard king rooms also feature sofa beds. These rooms are limited in quantity and are assigned upon request. All rooms feature a 32-inch, flat-screen TV and a comfortable chair, in addition to an oversized desk that doubles as a workspace and a spot for child play. A dry bar, stocked with complimentary Starbucks coffee and Tazo tea, contains a mini-fridge and a coffee maker. Bathrooms feature two sinks and a separate U-shaped vanity, and are thoughtfully stocked with a range of Shine by Bliss products. Some rooms have balconies. Cribs, bed rails and outlet plugs are complimentary upon request. There is a surcharge for more than two adults in a standard room. Connecting rooms are available. Deluxe Alcove Rooms add more space, premium views and a table for four. These accommodations feature a bed in bed in the bedroom area, and a sofa bed, a TV and a lounge chair in the living area. These rooms accommodate four, and can fit five with an optional rollaway bed. Swan Executive Suites are set up more like a living room than a bedroom, but can be combined with one to two standard rooms for more elbow room and privacy (extra fee applies). Besides a sleeper sofa, a TV and a full bathroom, these rooms feature a desk, a conference table and a wet bar with a mini-fridge. More upgraded suite options, from Grand to Presidential Suites, are also available. With regard to room location, resort view rooms facing Crescent Lake offer some of the prettiest vistas, but are sometimes less than peaceful due to activity on the waterfront. Plans for a guestroom refurbishment are in the works. The Dolphin features just more than 1,500 guest rooms, including 112 suites, situated in a 27-story main building and four, nine-story wings. Standard guestrooms contain two double beds or a king size bed and sleep up to four. With an optional rollaway bed for an extra fee, an additional person can be accommodated, totalling five in one room. Some standard king rooms also feature a sofa bed. These rooms are limited in quantity and are assigned upon request. All rooms feature a 32-inch, flat-panel TV and a comfortable chair, in addition to an oversized desk that doubles as a workspace and a spot for child play. A dry bar, stocked with complimentary Starbucks coffee and Tazo tea, contains a mini-fridge and a coffee maker. Bathrooms feature a single sink in a separate U-shaped vanity and are thoughtfully stocked with a range of Shine by Bliss products. Some rooms have balconies. Cribs, bed rails and outlet plugs are complimentary upon request. There is a surcharge for more than two adults in a standard room. Connecting rooms are also available. Deluxe Alcove Rooms add more space, along with premium views, a separate work area and a walk-in closet. These accommodations feature one bathroom and either one or two beds, and a living area, with a sofa bed, a TV and two lounge chairs. Premium Studios, a category unique to the Dolphin, are larger still, as well as more expensive. These rooms offer one or two beds, plus a sofabed, a larger TV and a table for four. Dolphin Executive Suites are set up for business, but can be combined with one to two standard rooms for more elbow room and family privacy. Dolphin Executive Suites include a Murphy-style bed, a sofa bed, a desk and chair, a TV, a full bathroom and a wet bar with a mini-fridge. More upgraded suite options, from Governor's to Presidential Suites, are also available. Rooms feature Wi-Fi access for a fee. With regard to room location, resort view rooms facing Crescent Lake offer some of the prettiest vistas, but are sometimes less than peaceful due to activity on the waterfront. For easy access to the pool, ask for a West Wing accommodation. Thank you for making our stay feel special from the moment we checked in at 2:30am. The balloons, birthday card and complimentary voucher for ice cream was a real hit with my daughter who turned 9. There was so much activities to do on the resort for my son as well (age 2) that we never made it to any of the Disney parks!! We will definitely return so we can finish our Disney trip and visit the parks. 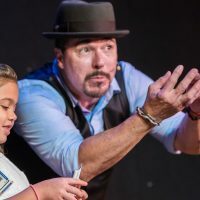 At this supervised childcare center, located on the first floor of the Walt Disney World Dolphin Hotel, kids ages 4 to 12 can enjoy games, crafts, dinner and a movie. Two hours of complimentary childcare is provided when parents dine at Il Mulino New York Trattoria, Shula's Steak House or Todd English's Bluezoo. Parents can also take advantage of free babysitting during a 75-minute treatment at Mandara Spa. Rates are $10 per child, per hour from 5:30 p.m. to midnight. Play air hockey and arcade games featuring fun pursuits like racing, golf and dancing at one of the two small first floor game rooms. Rooms are open from 6 a.m. to 11 p.m. daily. A resort showpiece, the expansive Grotto Pool features waterfalls, a waterslide and tropical landscaping. A smaller Spring Pool is adjacent. Nearby, you'll find a sizeable rectangular kiddie pool, as well as a lap pool. Pool games include contests like slide races, while activities at the nearby basketball courts range from hula-hoop contests to dump bucket relays. A DJ regularly spins tunes. Towels and life vests are available at the Cabana Beach Hut (open 10 a.m. to 5 p.m.), or after hours at the Health Clubs. At the Cabana Beach Hut, you can rent inner tubes and purchase sunscreen. Borrow basketballs at the Health Club. Restrooms with changing areas are located behind the Cabana Bar. Swim diapers are required for non potty-trained children and are available at Daisy's Garden. Note that lifeguards aren't on duty. Adult supervision of children under 16 is required. Pools are open from 9 a.m. to 11 p.m. Waterslide hours are 10 a.m. to 7 p.m.
Across from the Cabana Beach Hut, guests can get hair wraps, hair braids or temporary tattoos. These services are available from noon to 5 p.m.
On a scenic stretch of sandy beach on the shores of Crescent Lake, parents can relax in a hammock while the kids build sandcastles. Nearby, there's a playground, a giant checkers game and a spraying seal statue. A sand volleyball court and a campfire ring are in the vicinity. At times, the beachfront is the site of evening Movies Under the Stars and Glow Volleyball games. Paddle around Crescent Lake in a signature swan boat. The cost is $15 for 30 minutes of paddling. Rentals are available from 11 a.m. to 6 p.m. at the Cabana Beach Hut. Across the street and behind the Walt Disney World Swan, four lighted tennis courts are available at all hours for match play. Rent racquets and purchase balls at the Health Club. Nearby, at Disney's Fantasia Gardens and Fantasia Fairways, play 36 holes of mini golf. Hours are 10 a.m. to 11 p.m. Follow the footpath around Crescent Lake and enjoy entertainment on the BoardWalk. Options range from surrey bike rentals to a nightly carnival scene complete, with mimes, magicians and Mid-way games. Situated next to the lap pool, this casual spot offers indoor and covered outdoor seating. Guests can order pizza whole or by the slice. Ice cream sundaes and specialty milkshakes are a highlight. Kids' meals for ages 9 and under are served with fries. Choices include a cheeseburger, hot dog, grilled cheese or chicken fingers. Seasonal hours are 11 a.m. to 7 p.m.
Nightly dinner and weekend breakfast buffets with the characters are the draw at this first-floor family venue at the Walt Disney World Swan. Rafiki and Timon are in the house for dinner on Mondays and Fridays, while Goofy and Pluto make appearances on remaining nights, as well as at breakfast on Saturdays and Sundays. On Sunday mornings, Chip and Dale join them. Highchairs are plentiful. Dinner buffet hours are 5 to 8:30 p.m and breakfast hours are 6:30 to 11:30 a.m. A la carte lunch is served from 11:30 a.m. to 2 p.m.
At the lobby bar, enjoy fresh pastries and specialty coffee drinks in the morning. Open from 6:30 to 11 a.m. for breakfast. Ultra-fresh sushi, Kobe beef and nightly karaoke are the highlights at this sleek space. There is no children's menu is available. Hours are from 5:30 p.m. to midnight. Reservations are recommended. Enjoy family-style meals in an upscale atmosphere at this lively (and sometimes loud) Old-World bistro at the Walt Disney World Swan. Kids choices include pizza, pasta with marinara sauce, fettuccine alfredo and chicken parmigiana. Hours are 5 to 11 p.m.
Order up a plate of pancakes with fresh strawberries for breakfast, or cookies and milk for a late night snack. Lunch and dinner menus feature typical kids' fare, from chicken fingers to macaroni and cheese. Room service is available 24 hours. A novel 24-hour, in-room service allows you to stock up on beverages, breakfast items and snacks, at prices well below what you'd pay at the theme parks. For $4, you can order a six pack of bottled water for delivery to your guestroom mini-refrigerator, and for the same price, you can get four cereal bars, granola bars or individual servings of cereal. Milk is available by the quart. Order forms are provided in each guestroom and online. Situated next to the Dolphin Lap Pool, this cool, casual venue offers a number of choices for kids, including pizza, cheeseburgers, grilled cheese sandwiches or hot dogs. For adults, the flatbread pizza is a winner. The restaurant is open seasonally from 11 a.m. to 8 p.m. The bar remains open until 10 p.m.
At this bustling grill and ice cream fountain, kids will find familiar favorites like spaghetti, chicken tenders and cheeseburgers, along with milkshakes and ice cream sundaes. Kids' meals come with fresh fruit, like strawberries, chips and a soft drink. Guests can add an ice cream cone for an additional $1. High chairs are available. Hours are from 11 a.m. to 11 p.m. Families will enjoy the extensive breakfast buffet at this casual Mediterranean spot, which spotlights seasonal ingredients. Lunch is served a la carte. Hours are from 6:30 a.m. to 2 p.m. Advance reservations are necessary. Pick up some pastries and coffee. The lounge is open from 6 to 11 a.m. for breakfast and from 3 to 11 p.m. for drinks. Open 24-hours, this cafeteria-style dining room and convenience store dishes up home-style family favorites like pot roast and chicken pot pie, as well as pizza, tacos and a la carte items like salad, fresh fruit and yogurt. Kids' meal choices are available for children under age 10. These include an egg, meat and toast platter for breakfast, and macaroni and cheese, a hot dog, a cheeseburger or chicken fingers for lunch or dinner. Try the $25 Family Meal, which includes a whole chicken and a choice of three sides. In the check-out area, there's a selection of non-perishable breakfast and snack items, along with toiletries and baby supplies. A seating area contains booths and high chairs. For grown-ups, this is the place to go when you're hungry for prime steaks served in huge portions. A kids' menu is available. Hours are from 5 to 11 p.m. Advance reservations are recommended. Fresh seafood is the star at this sophisticated signature restaurant, which has an upscale atmosphere and a dress code. Kids' choices (ages 9 and under) include pasta with butter or tomato sauce, cheese pizza, fried fish, or grilled chicken or beef tenderloin. Meat-based meals come with a steamed vegetable and a choice of potato. Dessert is a chocolate boat floating on a jello sea to an ice cream "island." Hours are 5 to 11 p.m. Advance reservations are recommended. Families can order up a plate of pancakes with fresh strawberries for breakfast, or cookies and milk for a late-night snack. Lunch and dinner menus feature typical kids' fare, from chicken fingers to macaroni and cheese. Keep in mind that a 22 percent service charge, 6.5 percent tax and a $3 delivery fee will be applied. Available 24 hours. A novel 24-hour, in-room service allows you to stock up on beverages, breakfast items and snacks, at prices well below what you'd pay at the theme parks. Order forms are provided in each guestroom and online. Overnight guests enjoy a number of special perks, like early-entry and late-stay theme park privileges, known as "Extra Magic Hours." 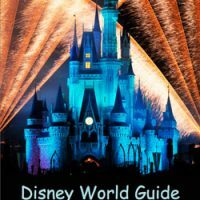 Additional benefits include free transportation throughout Walt Disney World Resort, the ability to make FASTPASS+ reservations 60 days in advance and free theme park parking with a resort room key. Guests can enjoy free games and entertainment at the pool complex, as well as complimentary childcare with dinner or a spa treatment. On select nights, guests can enjoy a colored light show on the resort causeway. Late checkout service is available. A Disney ticket counter is stationed in the lobby. For a single daily fee, children (ages 12 and under) of Starwood Preferred Guest program members can dine at and enjoy beverages from a variety of resort locations. Kids Nite Out and All About Kids are the resort-recommended providers for in-room child care. Both agencies require a four-hour minimum, and there is an additional fee for sitter transportation. Relax in the Meditation Garden at this 12,000-square-foot, Balinese-inspired spa, which offers manicures, pedicures, massages and a range of skin treatments for adults and teens (the latter who are ages 13 to 17). Book a treatment totaling $75 or more and receive two complimentary hours of childcare at Camp Dolphin. Located on the Dolphin Lobby Level. Hours are 8 a.m. to 9 p.m. Situated near Splash Terrace, this fitness room offers a range of equipment and is open to guests ages 16 and up, from 6 a.m. to 9 p.m.
Jogging trail maps (Disney's BoardWalk, around Crescent Lake) are available at the Health Club or through the concierge. When traveling to Walt Disney World Resort, it's best to avoid peak travel periods. Generally, these times include holidays and the summer months -- typically when schools are out of session. Besides times when major conventions are held, periods when festivals (Food and Wine, Flower and Garden) take place at nearby Epcot are known to increase hotel occupancy. A resort-sponsored Food and Wine event is held in October. During summer and on holidays and weekends, the resort expands its array of planned activities, particularly those at the pool and beachside. On select evenings from post-Thanksgiving through Christmas, Santa and Mrs. Claus set up shop in a tiki hut stationed in the causeway between the Swan and Dolphin. Additional holiday activities include elf tuck-ins and cookie decorating. 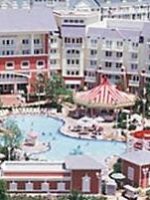 The resort is approximately 20 miles from Orlando International Airport (MCO). Airport transportation options include taxi, Mears shuttle service, private limo or Town Car service. You can also rent a car and drop it off at the resort, which hosts an Alamo/National desk. To reach the resort by car, take the South Exit Road from Orlando International Airport to SR 417 Toll Road GreeneWay West and follow signs to Epcot Resorts/The Walt Disney World Swan. Families can reach Disney's Hollywood Studios and the International Gateway at Epcot by walkway or boat. A boat launch is located between the Swan and Dolphin. Free transportation to and from Disney's Animal Kingdom Theme Park, Magic Kingdom Park, Downtown Disney and Walt Disney World Resort water parks is provided by bus. Resort parking is $16 per night for self-parking and $26 per night for valet service. Enjoy dinner at Kimonos or Il Mulino New York Trattoria, followed by a stroll around the BoardWalk. You can also opt for a couples massage followed by a drink at one of the lounges while the kids are at Camp Dolphin.